I don’t make it a secret that M.B. 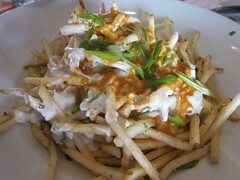 Post is practically my favorite restaurant in the South Bay and one of my top picks for all of Los Angeles. 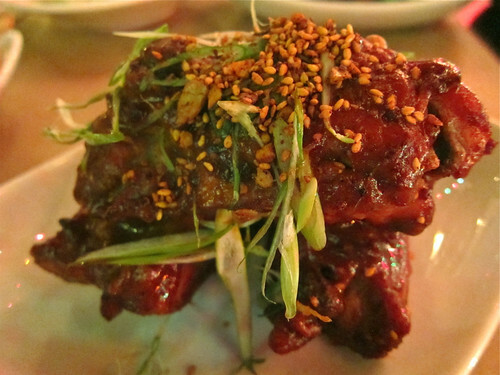 So it pains me to admit that I wish I lived closer so that I could take advantage of their new “Nooner” menu – essentially a weekend daytime menu that’s served from 2 – 5 in the weekend afternoon but also lunchtime until dinner on Friday afternoons. 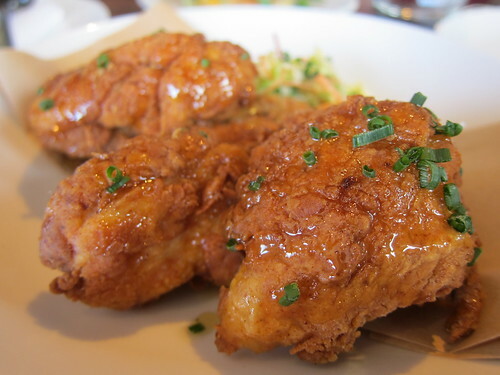 You can count on Chef David Lefevre’s terrific truffle honey laced fried chicken to be on the mid-day list, as well as Albondigas and Meyers’ Farm “Never Ever” Skirt Steak. Order the Pomegranate Cous Cous with lavender feta, Marcona almonds and grapefruit and the Blistered Green Beans with Thai basil, chili sauce and crispy pork to pair, and you’re pretty much all set. Oh, but wait. You’d be remiss not to try one of the awesome cocktails at M.B. Post. Since it’s daytime, go for the Coughlin’s Law, or the glorified Bloody Mary. Complete with quail egg, dill and picante, this will likely be the best Bloody Mary you’ve had in awhile. If you’re good to actually make it to weekend brunch at M.B. Post, even better. You’ll have your choice of egg dishes, including the incredible Breakfast Frittata and the same Meyers’ Farm steak but with a sunny side up egg. Their Benedict incorporates the famous bacon cheddar biscuit and La Quercia prosciutto and truly makes me do a happy dance. Either way, any time of day – even dinner – is prime time at M.B. 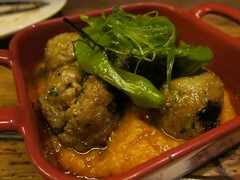 Post, since there’s such a great selection and execution of small plates for every occasion. 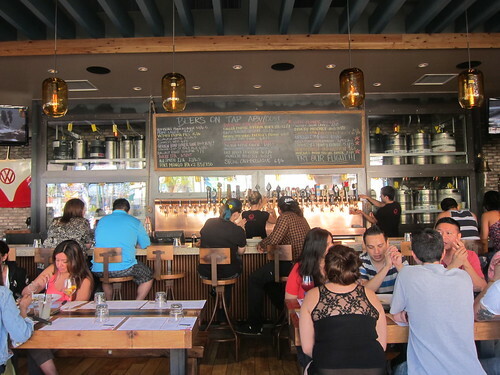 With the Gastropub Category in Los Angeles having undergone some oversaturation the past couple of years, it’s easy to dismiss the incoming restaurants that effuse that now-cookie cutter, industrial feel, which may or may not serve as a backdrop for small plates served at communal tables. Itâ€™s not to knock small plates. Iâ€™ve always been more a grazer than one to focus on the entrÃ©e at the center of my meal. Iâ€™m not knocking communal seating, either, since I far prefer bar seating myself. Yes, it’s also “farm-to-table,” as much as I loathe how hackneyed that term has become. But it doesn’t discountÂ the restaurants where it’s actually a practiced philosophy – only at those where it’s feigned. I guess what remains, then, is really how interesting these small plates are, from the appetizers to the medium dishes to the family-style roasts and main events. 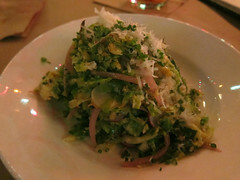 What the particular chef’s spin on savory might be. Yes, you can guarantee that there areÂ beets and braised meats on the menu – but why come here as opposed to any of the other gastropubs in the city? At least one answer would be its advantageous location on Beverly Blvd. Beyond that, though, my lone experience at Cookâ€™s County was a surprisingly stellar one. With Chef Dan Matternâ€™s previous post being at AMMO (a place I always had a mind about revisiting more often than I have) and his citing Mark Peel, Nancy Silverton and Suzanne Goin as mentors in the kitchen, youâ€™ll find the taste of his dishes reflecting his practice of utilizing fresh produce while highlighting the properties of each dishâ€™s ingredients.Â Thankfully, no flavors are masked – just beautifullyÂ enhanced.Â Each dish stops just short of going too far but holds its own with each ingredient serving its purpose in the whole. The flavors pop. I really enjoyed the bulk of the mains. 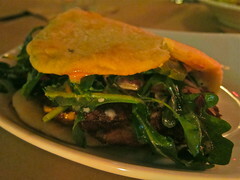 The appetizers, which could have doubled as salads, had arugula weaving a common thread through themÂ â€“ though they were mostlyÂ tasty in and of their own. Next time, I might order just one under that columnÂ and be done with it. Or, I’ll go straight to the mains. Though I wished the Pacific Seafood Soup was more soup than broth, it was because I was sopping up the last of whatever was in the bowl by the end of the night. Awesome, rich flavor. And it’s not like I haven’t seen Rabbit Tagliatelle before, but this rendition was tops. 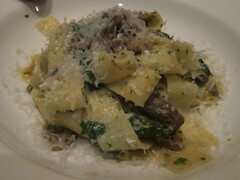 The freshly made pasta was no detail, and the rabbit was deliciously tenderÂ as was the lemon zest a nice seasoning. 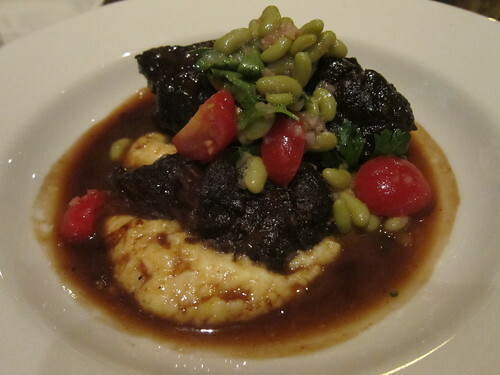 The braised beef cheeks were as heavenly as the bean salsa that topped it was unexpected. The accompanying tomatoesÂ made forÂ sweet, little bursts of flavor in the rich canvas. 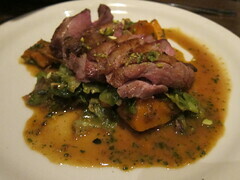 But the wood-grilled duck breast was exceptional. Granted, I do love brussel sprouts all around as I do kabocha squash, but I’d be hard-pressed to find duck that flavorful in all but a few restaurants around L.A.
There’s a modest international selection of beers availableÂ but a larger wine list for vinos. I can appreciate the simple menu at Cook’s County, because I’m a believer in too much selection abetting too much indecision (personal quirk). It lends an appreciation forÂ the focus it takes to perfect those delicious mains. And, they do lunch and brunch. Those are certainly now on my to-do list. I hope Cooks County is here to stay. 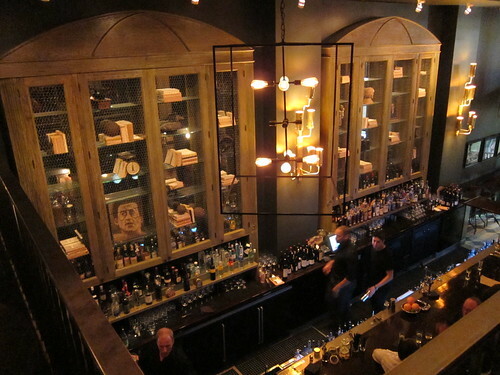 Though gastropubs are now a dime-a-dozen, this one stands head and shoulders above the rest. 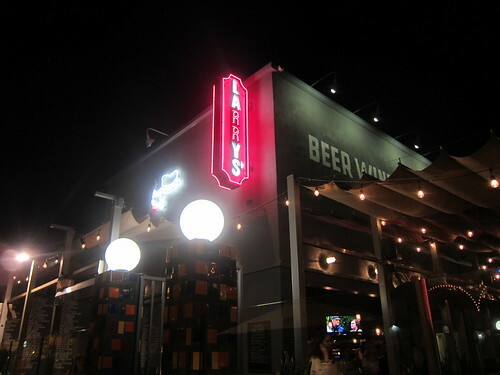 It may be named after the county which seats Chicago, but Beverly Boulevard and Hancock Park can be proud (and on the weekends, they can be proud until 1 AM). P.S. – Don’t forget dessert. That Angel Pie was divine. Hollywood is an awesome place to live. Not because of the bottle service and certainly not because everyone drives in from The Valley and Orange County on the weekends for the purposes of said bottle service. 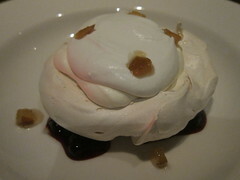 The food is created by Gavin Mills, who was last sous at Bastide under Joseph Mahon (see previous post). As done in more and more eateries out there, he employs snout to tail and locally sourcing philosophies in that small kitchen and does a great job doing so. All the charcuterie, pates and rillette are made in-house, and together with cheese, start at $8 for three, $12 for five and $15 for seven. I sampled about half of the small, manageable menu (I’m all for quality execution over spreading oneself thin while indulging indecisiveness) and, of everything I tried, came up with a handful of favorites. 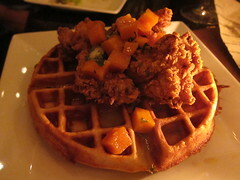 The chicken and waffles was a refreshing rendition, with fluffy breading surrounding a sparingly syruped quarter-chicken over a bona fide, house-made Belgian waffle. The maple-roasted squash was delicious, too, with the $14 serving being none-too-sweet. Just perfect, actually. 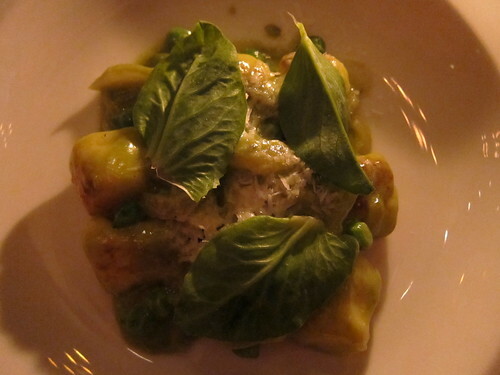 The gnocchi were savory pillows, accompanied by pea tendrils, spring garlic, confit onionsÂ and just a touch of truffle. Beautifully simple and delicious. And if you want a little twist on traditional lasagna, Wood & Vine’s oxtail variety comes in its own, adorable Pyrex glass with horseradish and house-made ricotta – and packs a subtle, but muchÂ appreciated,Â kick. But oh, those scallops. 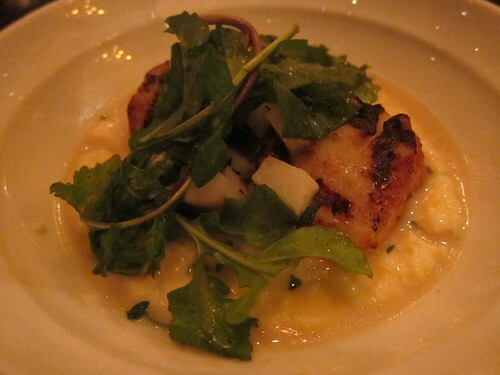 Granted, you have to screw things up really bad if you turn out bad scallops, but not only are these huge babies perfectly seared (with that crispy,Â barely-charred exterior), they come accompanied with Jerusalem artichokes uponÂ some deliciouslyÂ truffled grits. There was nothing left on the plate when I was finished – not even a smear of grits. I have yet to go back and try more cocktails (headed up by Jason McBeth)Â on for size.Â The Manhattan I ordered was good once I requested that it be served straight up (since it was initially served on-the-rocks), but I’m thinking that since I went early, they’re still getting their program squared away. However, their brown (whiskeys, ryes, bourbons, what have you) selection looks somewhatÂ extensive, so I can’t wait to take a closer look. The dessert menu looks enticing, too, if also humanitarian, with proceeds from the sales of profiteroles going directly to the Los Angeles Youth Network – a cause that the owners care about. 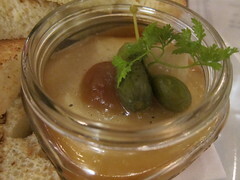 Another dessert that caught my eye: Butterscotch pot de creme with salted caramel ice-cream. Mmm. The guys behind Wood & Vine, despite the big space, did a great job at creating a warm ambiance and concentrated food and cocktail menu with only the necessities. It’s the place that nightclub birds walk past on their way to Hi-NRG spicy tuna wonderland while you’re inside, cozy while nibbling cheese and sipping on your Aviation – perhaps alone, perhaps in a group (because it’s big enough for that). 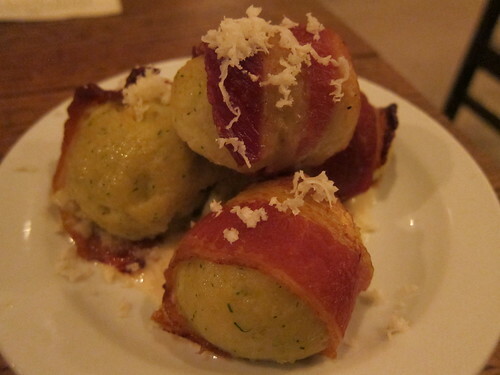 The food interwebs has been all aflutter lately about gastropubs – myself not excluded.Â The craze over savory, rich and salty dishes only helps the shared, small plates-style of serving guests become more commonplace in a city (that’s us, Los Angeles) that prides itself on accessibly delicious food. And if not, then everyone at the table gets a taste without the commitment. 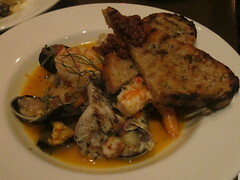 All this harkens me back to a dish I had earlier this fall at The Gorbals. (Better late than never. )Â Indeed, it was the standout dish not only because it was well-executed, but also evokes a sort of blasphemous, tongue-in-cheek humor. Though I’m not Jewish in practice nor ethnicity,Â my name is stillÂ Esther on the phone and I spend my 9-5 outnumbered by non-kosher Jewish colleagues. It goes without saying, then, that most of them now know of this dish that they can only get in Downtown LA, and preferablyÂ not on a Thursday night,Â should they favor avoiding the Art WalkÂ crowds (go early, should you favor being a part of that crowd yourself). It’s not inÂ a soup, but the balls thrive onÂ their own as piping-hot, juicy spheres of ground matzo and chicken stock. Of course, theyÂ are all taken to that level with the tenderÂ strips of bacon that make the orbit. The globes of matzoÂ sit atop mustard aioli and are briefly showered with fresh-grated horseradish, which helps keep things from resting upon the bacon’s laurels by packing a couple punches inÂ those couple of ways. The aioli really is perfect. I will return for these andÂ one of their many solidÂ cocktailsÂ that rotate their chalkboard. 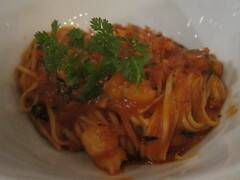 Besides, there are many otherÂ small platesÂ on Ilan Hall’s menu I have to try. It doesn’t mean that they can’t make for a big meal.